Can be made the regular way, or the gluten free version. 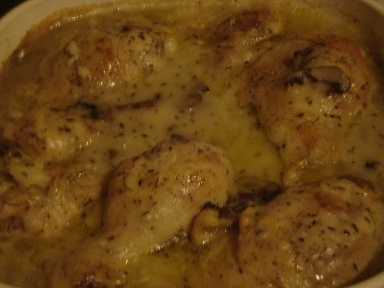 Before going gluten free I used to make this chicken and rice recipe using a can of Campbell's Cream of Mushroom Soup and the packet of Lipton Onion Soup. I used 1/3 can of water and 1/3 can of milk so it would be thicker than the soup. Then I put 2/3 of this mixture into the cooked rice and mixed it well. The chicken was put on top, salted and peppered, and then covered with the rest of the soup mix. Then I baked it at 350 degrees, covered, for 1 1/2 hours. I removed the lid for the last 30 minutes to brown the chicken. I served it with green beans. Now I make a gluten free version of this chicken and rice recipe, using my own cream of mushroom soup, and add the substitute for the Lipton Onion Soup. Sometimes I add dehydrated onions also, or I chop 1/2 an onion and brown it and add that with the onion powder mix. So if you are on the gluten free diet, use the chicken and rice recipe below. You can use regular rice, (2 cups of water per cup of rice, simmer 20 minutes) or Instant Rice, whichever you prefer. If you want a lot of leftovers, or have a large family, you can increase the ingredients by 50% or double. It depends on the size of your casserole dish as well. Once the rice has come to a boil, and is simmering, you can start the cream of mushroom soup. I use the proportions here to replace the condensed soup from the can. It will thicken it enough to be similar in consistency. Just like for a white sauce, melt the butter and let cool a bit or just use oil. Add the flour and stir to make a paste. When it is smooth, turn on the heat to medium and keep stirring slowly until it comes to a fast simmer. If you can keep it cooking about 5 minutes it will taste better, but that is optional. Once it has come to this point, begin adding the milk slowly, making sure you can keep it smooth and avoid lumps. Once all the milk is incorporated keep cooking as it thickens until it reaches the thickness you want. You should be able to make a temporary clear spot if you pull the spoon across the bottom of the pan. Remove from heat. If it gets too thick, add a bit more milk and water. Drain the mushrooms and put them into a saute pan with a little oil or spray with cooking oil spray first. Saute mushrooms (and onions if using) until they get some color and are almost tender. Add the thyme and basil to this and let them cook a little bit when mushrooms are almost done. Put the mushrooms & spices into the soup. Stir until well combined. Add the packet equivalent of the mix of onion soup. Stir in well. When all is smooth and well combined, pour 2/3 of the soup over the cooked rice in the casserole dish. Blend in. Smooth rice to flatten top. Put the chicken on top. (If you wish to brown the chicken under a broiler first you can, but I just put it on. The 1 1/2 hours of cooking time thoroughly cooks it.) Salt and pepper the chicken. Pour remainder of soup mix over chicken and rice. Cover and bake in preheated oven at 350 degrees, for 1 1/2-1/3/4 hours. Remove cover during last 30 minutes to brown chicken. Leftover rice goes well with baked chicken or pork chops. I usually serve with green beans.